Crock Pot Black Bean Enchiladas- A Keeper! A 5 star recipe! It was SO good. It was another crazy Wednesday with me tutoring (did I tell you that I tried to quit this tutoring job and the owner of the company denied me?! Yes, the owner didn’t let me quit… she steamrolled me! But I am going to try again, via email, so she can’t do it again. I hope!) and my daughter having gymnastics. Just a note: this recipe doesn’t have to be meatless if you’d rather not. Taco Bell has that smothered burrito that my husband loves and I think this could be a good substitute! Although there is NO alternative for Taco Bell as far as I’m concerned! I think this recipe was amazing, but I don’t know if it could be amazing with all the variations out there. First of all, I used flour tortillas. I’m not a huge corn tortilla fan unless they’re 100% fresh, cooked to order, and steamy hot, so I’m not sure if this recipe would be a 5 starer for me if I used corn tortillas. Secondly, I’m not sure if it would be as amazing if I used another salsa. I used Trader Joes Organic Tomatillo salsa, my favorite Trader Joes’ salsa. No spice to it whatsoever (my toddler who thinks yellow mustard is spicy likes it), but the flavor is amaze-balls! I’m definitely going to mix it up next time I make this and I’ll update this post when I do with my results. But in the meantime, I encourage you to make this and then comment below with your results. Use your favorite kind of tortilla and your favorite kind of salsa and let me know if it’s worthy of 5 stars! In a medium bowl, mix together the onion, pepper, black beans, corn, spices, meat (if using), and just 1/2 cup of the cheese. Pour about a cup of salsa (half a jar) into the bottom of the slow cooker and spread it around evenly. Scoop about 1/3 cup into one of the tortillas, roll it up, and nestle it into the bottom of the crock pot. Repeat with the half of the remaining filling, rolling tortillas until the entire bottom of the crock pot is filled. Spread another cup of salsa over this layer and sprinkle it with another 1/2 cup of cheese. Continue with the remaining filling and tortillas to create a second layer. Top with another cup of salsa, but reserve the remaining 1/2 cup of cheese for later. Place the lid on the slow cooker and cook on HIGH for 2-4 hours. In the last 15 minutes of cooking, sprinkle the leftover cheese over the top and let it melt. Serve the enchiladas with the remaining salsa. Leftovers will keep for up to a week in the refrigerator. • You can cook the enchiladas for longer (6-8 hours on LOW), but we found that the tortillas in the middle start to get mushy while the ones touching the sides of the cooker get crispy. Still tasty, though! 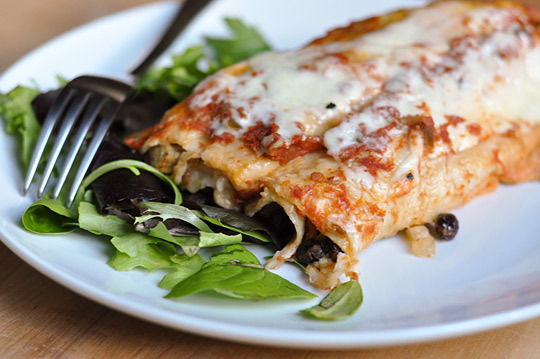 • To cook these enchiladas in the oven, layer the rolled tortillas in a 9×13 baking pan and cover with aluminum foil. Bake at 400° for 20 minutes. Uncover, sprinkle with cheese, and bake uncovered for an additional 5-10 minutes. • We haven’t tried it, but we so reason why this recipe couldn’t be doubled if your slow cooker is big enough. Just continue creating layers in the slow cooker and bake as usual.